As a homeowner within the Halifax Regional Municipality, you are responsible for a number of things on your property that affect Halifax Water's systems - water, wastewater and stormwater. Halifax Water is responsible for, and continually maintains and upgrades, the public water, wastewater and stormwater systems (the portion of the underground piped systems found in the street, as well as ditches and culverts, within the public right-of-way). The water lateral delivers water from the main in the street to inside your house. A water meter measures the amount of water delivered which is how you are billed. The wastewater lateral is designed to carry flows from toilets, sinks, bathtubs, showers, dishwashers and washer machines. The stormwater lateral is designed to carry flows created by rain, groundwater and snow melt including stormwater from sump pumps and yard drains. 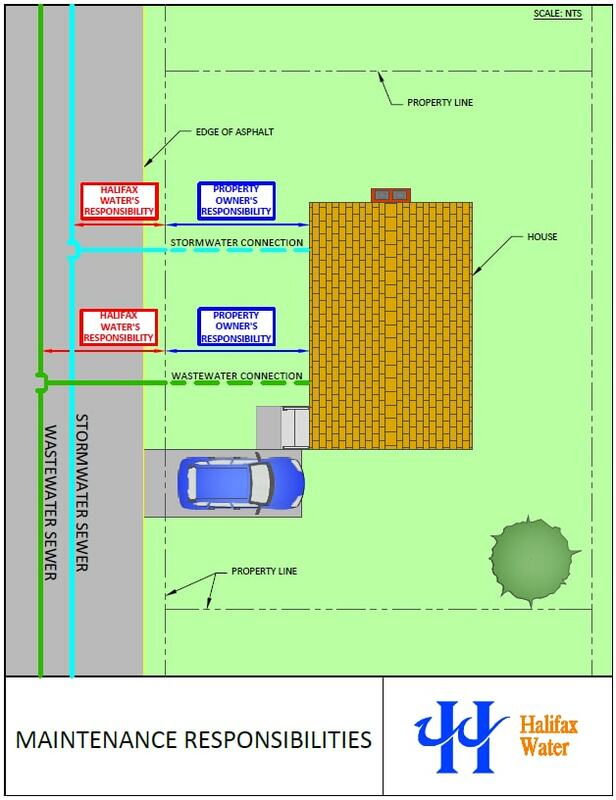 The diagram shows stormwater and wastewater lateral connections that are your responsibility. Halifax Water is governed by various regulatory requirements as laid out by the Nova Scotia Utility And Review Board and Nova Scotia Environment. To help meet these criteria, Halifax Water requires private property owners to also comply with requirements as found in Halifax Water's Rules and Regulations [PDF]. What is Stormwater Inflow and Infiltration? Inflow and infiltration (I&I) happen when unwanted stormwater enters into the wastewater (sanitary sewer) system and creates extra volumes to be carried in the pipes. 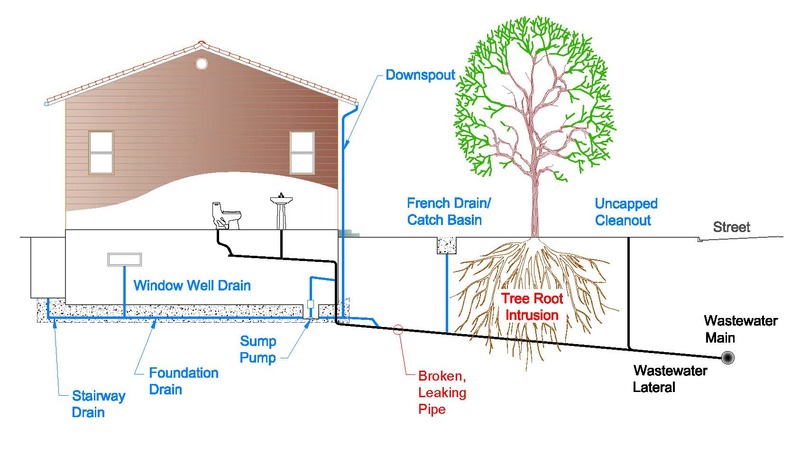 Inflow is stormwater that enters the wastewater system through a direct connection such as foundation drain (weeping tile), roof drains and downspouts, sump pumps, uncapped cleanouts, catchbasins, and other drains from your yard or driveway. Infiltration refers to stormwater (including groundwater) that enters the wastewater system through cracks, leaks, or roots in the pipes. Inflow and infiltration are most common during wet weather events (rain storms, snow melt, high groundwater), when the pipe network is not able to handle the surplus flow. This causes backups in the system, overflows to the environment (streams, lakes, harbour, beaches, etc. ), and flooding of private property including wastewater backups into basements. Exposure to these releases can be hazardous to human health and the environment. Potential sources of stormwater inflow and infiltration draining into the wastewater system. These videos from BC Capital Regional District show common sources of inflow and infiltration on private and public properties. Please note that these videos are not exhaustive. For example, sump pumps connected to the wastewater systems are major contributors of inflow in Halifax Regional Municipality and they are not illustrated in these videos. As per Halifax Water’s Rules and Regulations [PDF] discharging stormwater into the Halifax Water separated wastewater system is illegal in the Halifax Regional Municipality. The Regulatory Services Department of Halifax Water manages the Inflow and Infiltration (I&I) Reduction Program. The goal of the I&I Reduction Program is to reduce stormwater inflow and infiltration from private properties from entering into Halifax Water’s wastewater system. Where inflow and infiltration are found, the property owner is required to perform actions to fix the problems, within a specified timeframe, to bring the property into compliance. Not complying with this requirement may result in suspension of service and/or other penalties. It is your responsibility as a property owner to manage the stormwater generated on your property and prevent stormwater inflow and infiltration from entering the Halifax Water wastewater system. Damaged/leaking wastewater lateral caused by roots, poor joints, cracks, etc. What Do I Do With My Stormwater? Ideally, stormwater should be dissipated across your property, allowing it to flow across the surface and soak into the ground. Roof drains, sump pumps, and foundation drains should be directed to your yard where possible. You need to ensure this does not cause drainage issues on your property or neighbouring properties and will not cause icing concerns on private and public properties during the winter months. In areas of Halifax where piped stormwater systems exist, you may contact Halifax Water to get a permit to connect your stormwater sources to the underground stormwater system. You may want to engage a qualified professional (contractor, plumber, or engineer) to help you assess your options about how to best handle your property’s stormwater.